Pinecone 🌲 blogging rn! We woke up to a leisurely breakfast with Goliath who had got us some pastries from the local bakery. The rest of the day was spent idle in Tehachapi running last minute errands. I watched the webinar on the Sierras for 2017. This is the largest snow year since 1973! Amazing, I can’t believe we are giving it a go. The webinar is actually really informative and gives you some confidence if anything, breaking down how to cross flooded rivers and all the potential routes out of the mountains and back to civilisation. At 2pm we vacate the hotel and head to the park. It’s over 100•f today and we need to wait for the sun to chill out before we hit the trail again. Our hiking group has grown! We now have Justin, Jamie, Perk (Percolator), Little Spoon/our Brucie , Goliath and Dave walking with us. Justin calls a few trail angels to negotiate a lift out to the highway. In the meantime, I sample the towns local Ostrich Burger, a little overrated if you ask me. At 5pm, 5 of us hop in the first shuttle. I forget the angel’s name :-(, but he tells us lots of interesting facts about the worlds biggest wind farm which we walk through, and the old cement industry, used to build the LA aqueduct and the Hoover Dam. We have instructions to walk down the east side of highway 58 until we get to a culvert and then go under the culvert and wait for the other in the second shuttle where it’s nice and cool. The instructions are a little vague but when we understand it’s about 1.5 miles down we head off. We climb a few barbed wire fences, which are never fun and then wait at the culvert for the others. 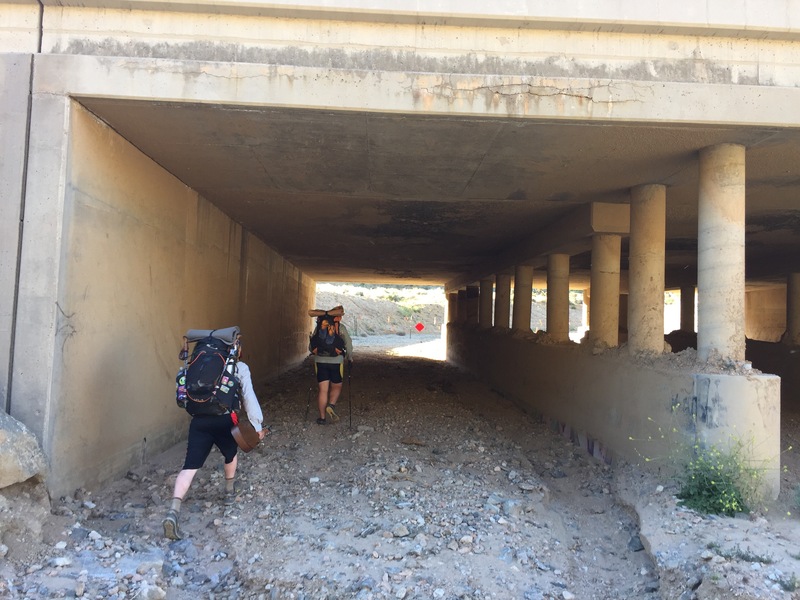 It seems to take forever and there is a mix up where they have been looking for us under culverts in the other direction, meaning miles for extra walking for Justin, Jamie and Goliath. We finally figure it out and re-group and begin our climb out of the valley. It’s now 7:30pm and we are aiming for a campground 12 miles in. The culvert under the freeway, mud on the walls is from a flood two years ago. The light is fading as we climb up out of the highway Valley. 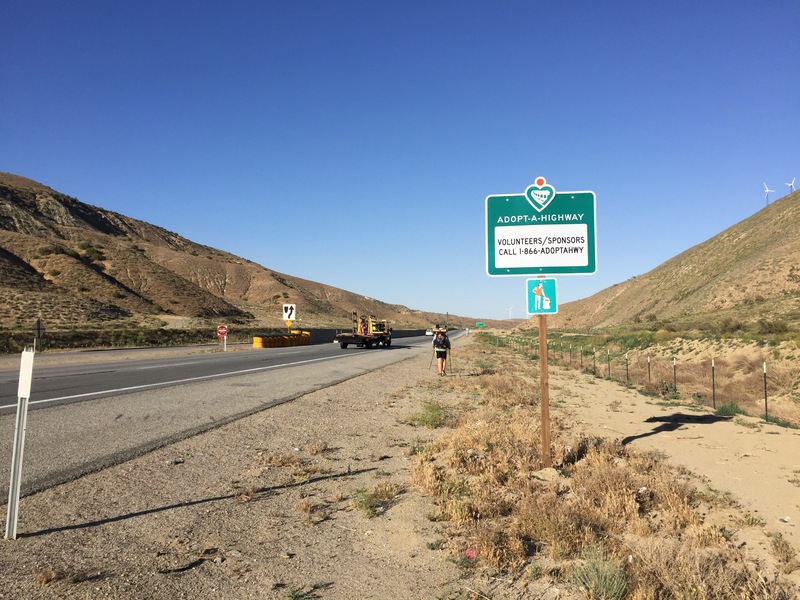 We begin to see the expanse of the giant Tehachapi Wild Farm project which extends into the Mojave desert. The Mojave creates a hot air channel upwards from it centre further east and then ocean air is sucked in from the west and enters the desert valley from this very highway Pass. It gives Tehachapi some of the cleanest air, however weather conditions are often windy and dusty. Makes a perfect home for wind turbines. It’s interesting to see the change in turbines over the decades, beginning in the 90’s with smaller (500 home) wind turbines. The newest ones are 8 times the size and now power 2500 homes each! 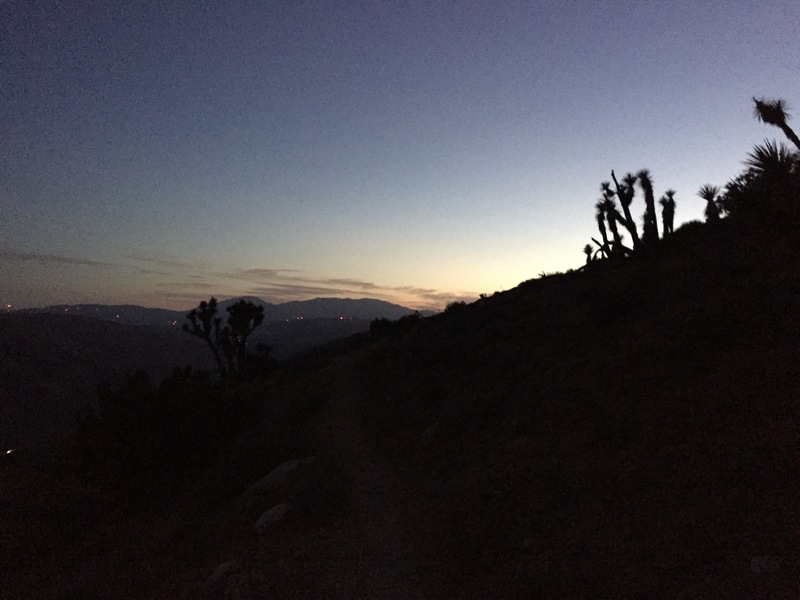 Light fading over the Joshua Trees. 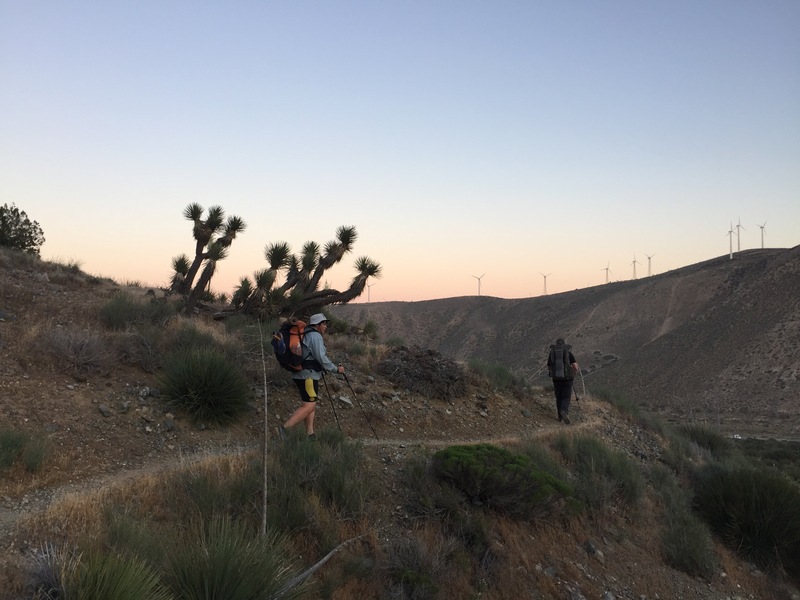 As we climb, admiring Joshua Trees in sunset colours, we also see a lot of hustle and bustle, city lights and traffic coming from the Mojave. It’s funny how empty it looks in the day times. 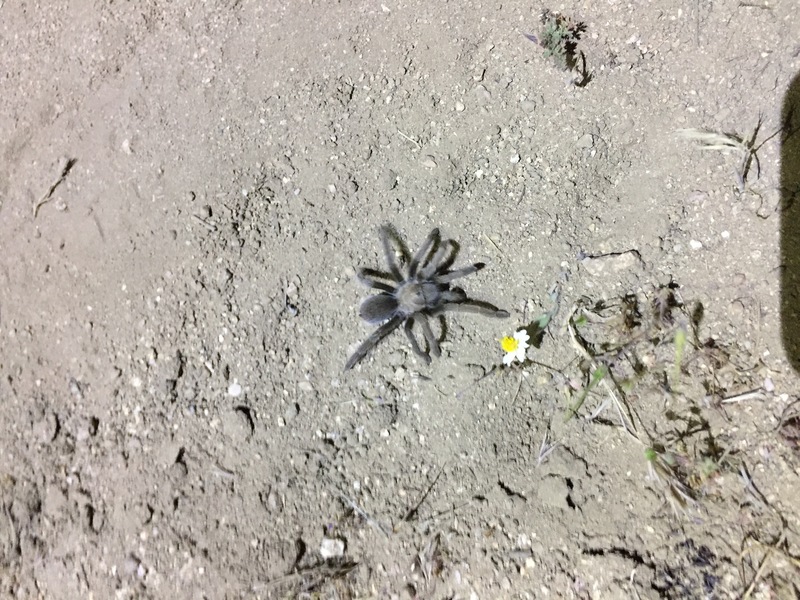 A Tarantula, not as scary as I thought they’d be. 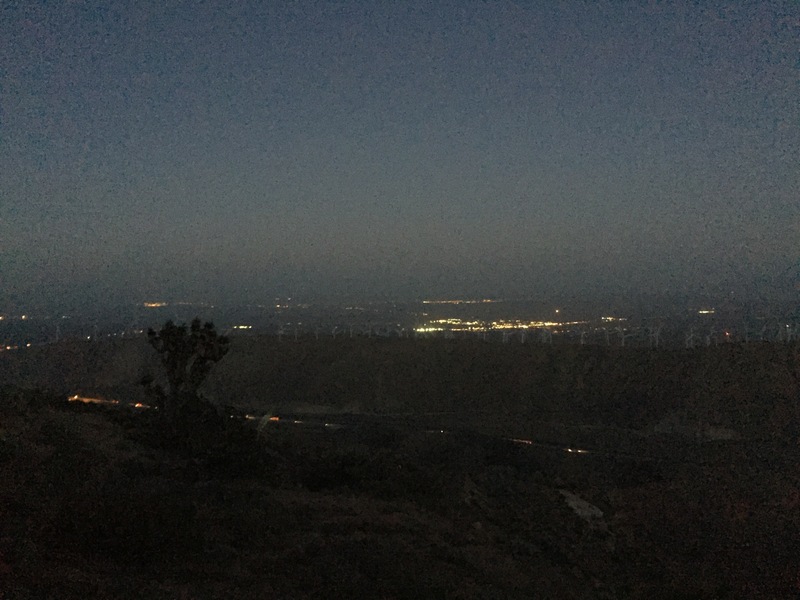 Looking down on the Mojave at night. At the top of the 1100m climb it is completely dark and we navigate via head torch. It often makes walking difficult, on slippery gravel and I tend to get bored quickly, needing the distractions of views. The path undulates and we finally get into our agreed camp, off the side of a dirt road around 12:30/1am. We are all exhausted and cowboy camp under the stars. ✨✨ idyllic. This entry was posted in PCT week 7 and tagged #pacificcresttrail, #pct, #PCTgirlgang, PCT2017. Bookmark the permalink.